I wish I could just intuitively take better care of myself. I wish I liked only healthy foods, and lots of exercise, and fresh air. It's really hard for me to make the best choices for my health and well being. One area I've been able to make some inroads in is with my skincare choices. Purxury is a brand created by a family looking to get rid of all the toxicity in their lives - to create skincare with natural and organic ingredients with names they could pronounce. It's also made in the USA, fragrance-free, and cruelty-free, too. 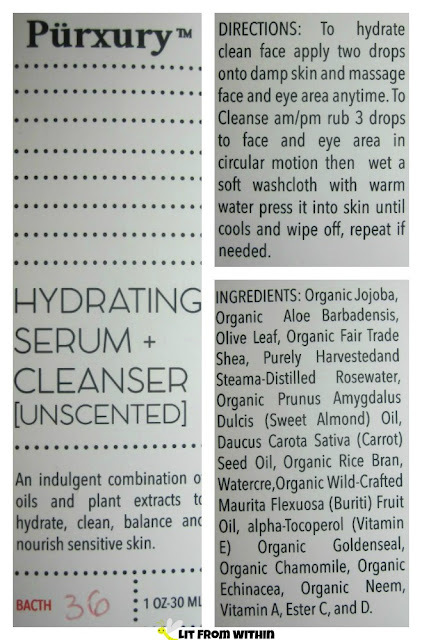 One look at the ingredient list, and you can see that there is so much skin-loving goodness in this bottle. Jojoba oil is an ester that is so close to our own skin's sebum that our skin can't tell the difference. Aloe is so nourishing and healing to the skin. Neem is naturally anti-bacterial, anti-fungal, and anti-viral, and in this oil blend, it doesn't lend it's fragrance to the mix. Shea is rich with vitamins and is an excellent moisturizer, along with many of the other fruit, vegetable, and nut oils on the list. This serum is also a multi-tasker! 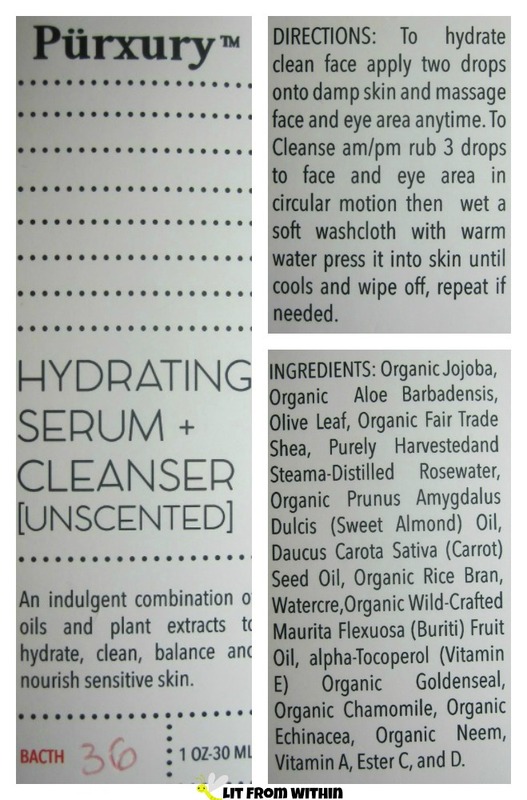 If you've ever cleansed with oil, you know how beneficial it can be - especially for those of us with oily skin. Oil likes oil - this clean, natural oil is lightly rubbed into the skin, and it breaks down the dirty oil and debris in the pores. Don't rush the process - it's not like slapping some soap on and then rinsing it off. Oil cleansing takes a little bit of time. When you're done, a warm, wet washcloth is the best tool for rinsing the debris off the skin. My oily face is cleansed and soft - and not the least bit oily, if you can believe it! Butters and esters draw moisture into the skin, while oils form a barrier to keep them there longer. Because of the blend of oils, butters, and esters in this serum, it makes a great moisturizer and a face oil. This blend is very thick - it reminds me of the texture of castor oil. It sits on the skin and takes a long time to absorb. I can't use this in my morning routine, or my makeup would just slide off! It's perfect for the last step in my nightly routine, though. If I'm traveling, or don't feel like using a bunch of products, I can use this to cleanse first, rinse off, then add a few drops as my serum, moisturizer, and face oil. Done! Simple dotticure based on the Purxury packaging. The base is Sinful Colors Snow Me White, and the dots are made with Wet 'n Wild Black Creme. 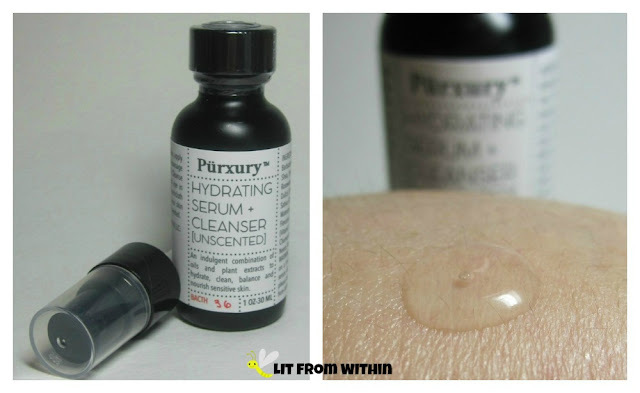 For more information, or to purchase, you can find Purxury on Facebook, Twitter, Pinterest, Instagram, and their website, where this serum usually retails for $59.95, but is currently on sale for $49.95. Now through 12/31/2015, I have a coupon code to share, too! If you use BEAUTY20, you can get a 20% off discount and free shipping on orders over $75 (US only).